Smart Eyewear are the computerized eyeglasses that generates digitalized images for its user. It helps to gain information, or to take pictures or record a video. It uses gesture and voice trackers that are positioned behind the arms of frame. Smart eyewear tracks user activities, make hands free calls and play music through speakers that are embedded behind ears. These devices are available in clear glasses and tinted (sunglass lenses) glasses. Industries manufacturing smart eye-wears understand the need for developing automated and hands-free applications that can cater to the need of supervision, more accuracy and less need of labor. They use optical mechanisms such as Heads-Up Display (HUD), a Head-Mounted Display (HMD) and Optical Head Mounted Display (OHMD). These devices or applications, provide precise and accurate measurements, thus increasing its application in aerospace & defense, architecture & construction, medical, electronics, energy & power, heavy machinery, entertainment and other sectors. Due to its widespread field’s applications and rising demands, it is expected to show tremendous growth in the future. The global smart eyewear market, in terms of revenue, which was estimated at US$ 4,548.97 Mn in 2017, is expected to reach US$ 20,796.21 Mn in 2022. On the basis of technology, smart eyewear are categorized majorly into augmented reality (AR), virtual reality (VR) and others. Augmented reality is a reality-based, interactive environment, which provides audiovisual and graphical effects based on a person’s real-life experience. Augmented reality and virtual reality makes use of animated hologram, virtual 3D models and interactive display. With the rising use of internet, advanced information and communication technology, smartphones, VR is fostering highest market share. Virtual reality creates an artificial environment to replace the existing reality. 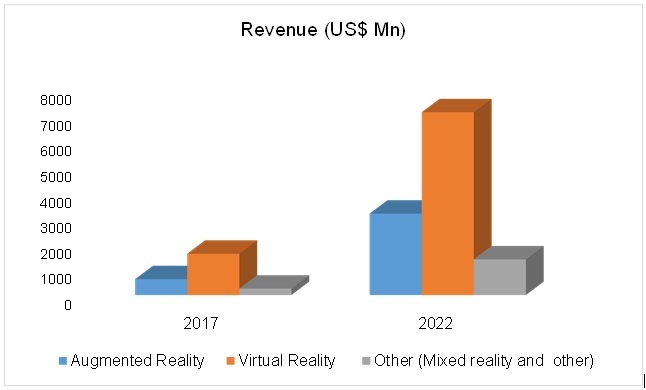 Incorporation of VR added functionalities into smartphones, computers and other devices have made VR usage cost-effective and its extensive applications in the field of architecture & construction, medical, electronics and entertainment has driven the smart eyewear market growth. Virtual reality is used on various operating systems (OS) such as android, Linux and others. Unlike other operating systems, android is an open source framework, which uses simple tools and applications. It also provides a user-friendly interface design and an improved power management and application control. These factors are driving the growth of market. The android operating systems presently holds the largest market size and is anticipated to be the fastest growing during the forecast period. Among the application type, consumer electronics is expected to hold the highest market share. With the increasing population, awareness of their fitness and well-being, growing entertainment and fashion businesses, busier lifestyles and rising standard of living, smart eyewear applications are providing fast, high accuracy and efficient visualization and interactive experiences. All these factors are driving the growth of consumer electronics segment of the market. 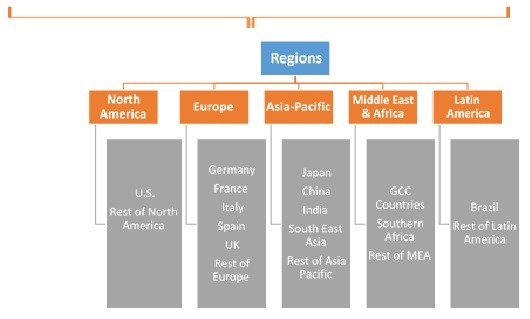 On the basis of region, Asia Pacific is the fastest growing region in the global market. Emerging economies for instance; India and China are witnessing huge growth due to penetration of advanced technologies and rapid industrialization. Industrialization has facilitated huge employment opportunities, which has ultimately empowered people to purchase smart eye wears. Increasing investments by major players has factored Asia Pacific to evolve as the fastest growing region in the global market. 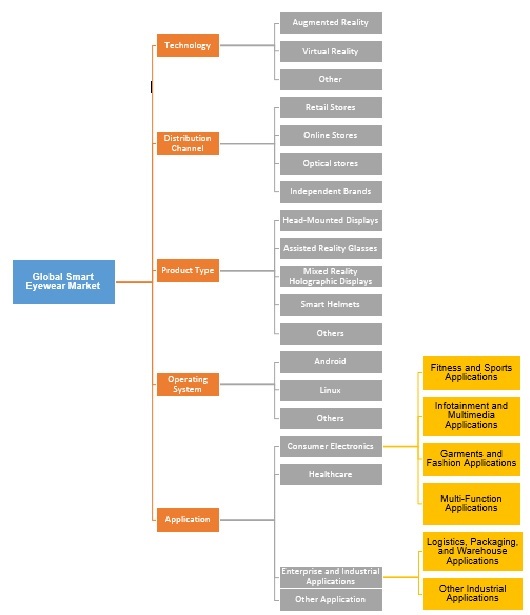 The smart eyewear market report provides both, subjective and quantitative research of the market, as well as integrates worthy insights into the rational scenario and favored development methods adopted by the key contenders. The report also offers extensive research on the key players in this market and detailed insights on the competitiveness of these players. The key business strategies such as M&A, affiliations, collaborations, and contracts adopted by the major players are also recognized and analyzed in the report. For each company, the report recognizes their headquarter, competitors, product/service type, application and specification, pricing, and gross margin. Some of the primary participants in global market are Microsoft Corporation, Meta Company, Epson America, Inc, BAE Systems, Samsung Electronics Co., Ltd, Osterhout Design Group, Inc, Recon Instruments, Inc., Kopin Corporation, Google Inc., Sony Corporation, VUZIX, Lenovo, Lumus Ltd and Optinvent S.A. amongst others.